He is considered to be the father of Underwater Diving Education together with Ferraro. They shared all initiatives in this sector and developed a relationship that was only interrupted due to Marcante's death. Together with Egidio Cressi, he was one of those pioneers from Genoa who started to dive in the 30s, before the Second World War, which he used to call "tribe from the rocks". Marcante used to develop and expand everything that Ferraro invented and started, such as the diving courses. This happened with the "Underwater Centre in Nervi", which was also founded by him in 1952 and of which he became the Technical Director after Ferraro's resignation. 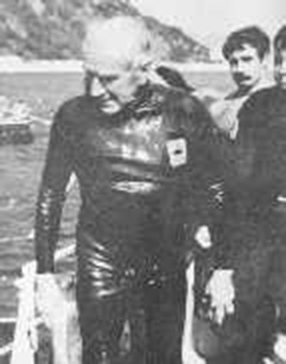 This happened with Underwater Carabinieri, who were trained by him for many years after Ferraro started up the course. It also happened with the Fire fighters' Course, as Marcante became the Course Director in the Training Centre where the Course was held, after Ferraro resigned because of his many professional commitments. Marcante's methods, resulting from the experience gained by working with Luigi Ferraro during training courses set up for fire fighters, were applied and gradually perfected by the Underwater Centre in Nervi and adopted by the F.I.P.S.A.S., who made them their own and diffused them throughout Italy. He was the author of the first "Federal Teaching Manual", the official text used by the Federation, which was studied by thousands of students and instructors. He wrote two books "Scendete sott’acqua con me" published by Ceschina and “Questo è lo Sport Sub” published by Mursia, and many articles and scripts featuring intense spiritual contents. He invented, in collaboration with Prof. Odaglia, a technique to compensate for external pressure on the eardrum, which was named Marcante - Odaglia in their honour. Duilio Marcante's contributions to teaching, despite being unanimously recognised and appreciated, remained confined within the circles of the underwater sports sector. The work that made his name known outside the sector of underwater sports was, instead, the statue of "Christ of the Abyss", which he designed as a tribute to the memory of his friend Dario Gonzatti, who tragically disappeared during a dive, and to create a place suitable for meditation and prayer underwater. The statue was realised free of charge by the outstanding sculptor Guido Galletti and the bronze used for the fusion was collected thanks to donations received from all over the world: propellers, fragments of ships, Olympic medals and medals for Valour, even a handful of bronze coins - ex voto - offered by the mother of a sailor who disappeared at sea. The remaining conspicuous costs of the operation were covered by the ship owner Giacomino Costa who played a very important financial role and who was also President of the Executive Committee which included among others Ansaldo, the Italian Shipping Association, Prof Luigi Ferraro, and the Command of Local Military Garrisons. 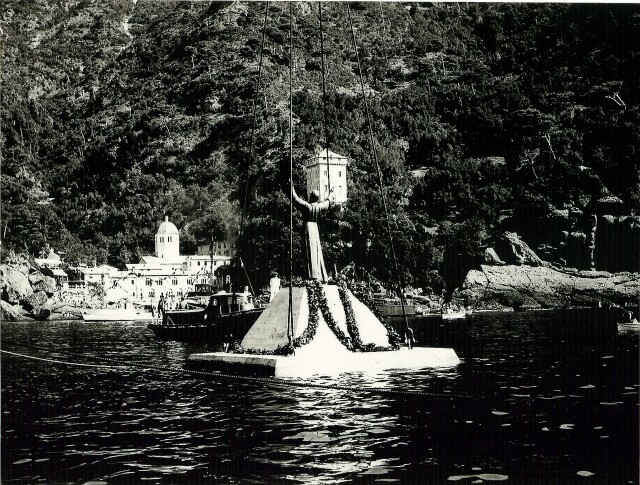 On August 29th 1954, in San Fruttuoso Bay, in front of the historic Doria Abbey, the statue was immersed underwater, 17 metres deep. It was 2.50 metres high, weighed 8 quintals and was fixed on a concrete pedestal shaped like a pyramid, which was 2.50 metres high, 5 x 5 metres wide at the base and weighed 80 tons. Pope Pius XII, gave his special blessing and a medal, which still lies at the statue’s feet.